A lot of city teachers bellyache about how UFT leadership is inept. They say, "Oh, how come I have to wait until 2020 to get the money most city workers got five years ago?" And then they're all, "How come Mulgrew will punch you in the face and rub it in the dirt for Common Core, but doesn't get upset when there's no contract for six years?" And then, they're like, "How come I only get one day to defend my livelihood if I'm an ATR teacher?" Some of them are even, "How come I'm an ATR teacher instead of going somewhere I can actually work? Lots of them these days are supporting this upstart caucus called MORE, which doesn't support that. Here's the thing, though. MORE may think that due process should apply to everyone. They may think Common Core doesn't merit any defense, let alone a violent one. They might advocate that, since we always took the city pattern when it was a piece of crap and had to give back to better it, that we shouldn't accept givebacks for a contract that's definitely inferior to the pattern. But will they represent all six boroughs? Sure, there are MORE members in Manhattan, Queens, Brooklyn, the Bronx, and Staten Island. But ask yourself this--how many MORE members are there in Florida? Can you name one? Neither can I. On the other hand, there are plenty of Unity Caucus members in Florida. Not only that, but there's also a UFT office in Florida. So next time there's a union election, you'd better believe Michael Mulgrew will be there in Florida making sure everything is hunky-dory for the UFT retirees. Do you think there will be any MORE presence there? Think again. Everyone in MORE is probably working in a classroom or something. 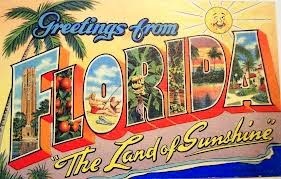 How the hell are they gonna get to the Sunshine State without getting fired? Despite what Campbell Brown may think, people who don't show up for work quite frequently find there is no more work to show up to. So remember, for those of you who want all six boroughs represented, your only choice is Unity Caucus. Remember, retirees make up 52% of the vote. It's very important that retirees have a large voice in determining who gets to negotiate new contracts. It's particularly important when you understand that new contracts don't effect them at all. That's why the Unity leadership was smart when negotiating the last contract. Screw the people who resign, or get fired, or move into administration. They can't vote anyway. The sixth borough is well-served, and those who move there will remember the people who got them that money ten years after they earned it. Remember, if you vote for those upstarts in MORE, they might try to change things so that only working school personnel gets to vote on who negotiates for working school personnel. And honestly, how is that fair?